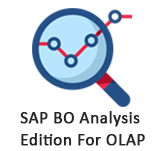 What is SAP BO Analysis Calculations? 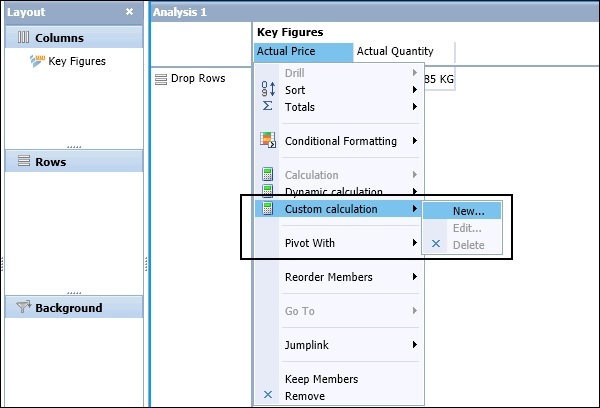 You can add calculation to improve the analysis and execute custom calculations in the analysis in a workspace. When you add a calculation to analysis, it is used as additional key figure on which you can put on Conditional Formatting and Filters. These calculations include unpretentious arithmetic operations - subtraction, division, percentage calculations, etc. These modest calculations can be made from the Calculation toolbar. To add a modest Calculation, click the Calculation button in the Toolbar. This will open the Calculation panel in the task bar on the right side. In the Calculation Panel, you need to pass in the name of calculation, Built on, Place After option. In calculation, you have to pass in the member on whom you need to perform calculation by clicking Add Member, and from Function you can select altered arithmetic functions and any operand value to complete the calculation. 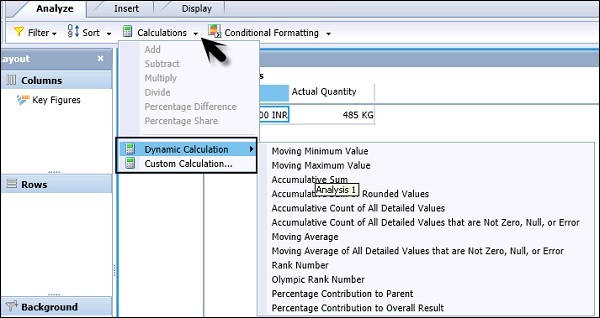 Custom calculations are calculations that you describe by making formulas in the Calculation panel. Custom calculations can be as modest as an addition of two members, or can be a complex combination of functions and members. Dynamic calculations are a extraordinary type of calculation that recalculates when the data changes in its associated members. When you click the Authenticate button, the position of look is updated in the Calculation. To add the calculation to analysis, click the OK button. To make a Dynamic calculation, you have to choose a key figure in the Crosstab and click the Calculation dropdown → Dynamic Calculation. You need to choose one of the dynamic calculations from the list. The calculation is added as a new column or row member to the right of or underneath the selected measure. A default name is applied. Moving Minimum Value Returns the current minimum value, within a hierarchy level, compared to the previous values. Moving Maximum Value Returns the current maximum value, within a hierarchy level, compared to the previous values. Accumulative Sum Returns the accumulative sum, within a hierarchy level, of all the previous values. This is based on the server-formatted value. Accumulative Sum of Rounded Values Returns the accumulative sum, within a hierarchy level, of all the previous values. This is based on the displayed values. Accumulative Count of All Detailed Values Returns the accumulative count, within a hierarchy, of all previous values. Accumulative Count of All Detailed Values that are Not Zero, Null, or Error Returns the accumulative count, within a hierarchy, of all the previous values that are not 0, null, or error values. Moving Average Returns the moving average, within a hierarchy, of the previous values. Moving Average of All Detailed Values that are Not Zero, Null, or Error Returns the moving average, within a hierarchy, of the previous values that are not 0, null, or error values. Rank Number Returns the rank order for each value, with the largest value having a rank of 1. Items with the same value will have the same rank. Note − you can’t use dynamic calculations as operand in further calculations and filters can’t be applied on custom calculations. In an Analysis, when you make a new calculation it is added later a specific member. When you choose a member in Crosstab, right-click to navigate to Calculation button and create a new calculation. The Place After field is mechanically populated. If you don’t select any member in the Crosstab and perform a Calculation, the Place After field is empty. The calculation is added to analysis and when a sort is applied, it is also sorted with the key figures.